Bobby Humphrey. Journal photo by Jordan Wald. As a youth growing up in inner-city Birmingham more than 30 years ago, Bobby Humphrey’s weekends in the fall offered a familiar routine. On Friday nights, he would play running back for the Glenn High School Hawks in front of small crowds at Fair Park or Lawson Field. On Saturdays, he would sell soft drinks to capacity college football crowds at Legion Field. From those modest beginnings in football and commerce, Humphrey would emerge to become a star in both fields. 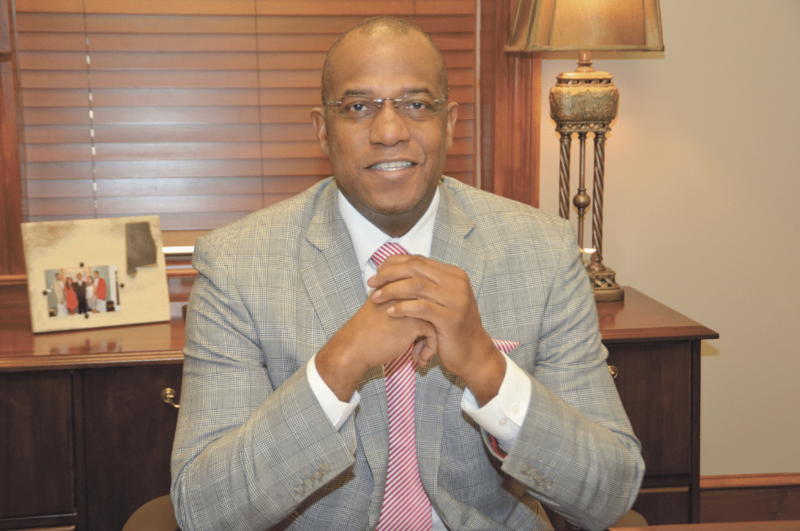 Starting with his days as an All- American at the University of Alabama and a National Football League standout to his present position as vice president for marketing with Bryant Bank, Humphrey has never been too busy to stop and smell the proverbial roses. “I can’t believe it’s been 32 years since I left home to go to Tuscaloosa,” said Humphrey, who turned 50 in October. Humphrey went to Alabama as a highly recruited running back and produced decent numbers as a freshman under Coach Ray Perkins in 1985. As a sophomore, Humphrey came into his own, as he earned the starting tailback spot in Perkins’ run-oriented pro-style offense. Humphrey rushed for more than 1,400 yards and 15 touchdowns, including 200-yard efforts against Tennessee, Mississippi State and Auburn. He became only the second runner in Crimson Tide history to exceed 1,000 yards on the ground in a single season, and he led Alabama to a 10-3 record. As Humphrey entered the 1987 season as one of America’s most celebrated college running backs, things were changing on the Alabama cam- pus. Perkins departed the program to take over as head coach of the NFL’s Tampa Bay Buccaneers. Bill Curry was brought in from Georgia Tech as the new Crimson Tide coach. The hire was controversial to many Alabama supporters, but Humphrey said he never saw a drop-off in the quality of coaching. The season’s highpoint may have come in the second game, as Curry’s Tide rolled to a 24-13 win over defending national champion Penn State. Humphrey rushed for 220 yards, including a 73-yard touchdown run that featured a spin-move that was replayed countless times on highlight shows across the nation. The acrobatic run even earned Humphrey a feature story in Sports Illustrated. Alabama struggled to a 7-5 record, despite Humphrey rushing for more than 1,200 yards and 11 scores. He earned All-American and All-Conference honors and was named Southeastern Conference Offensive Player of the Year. Humphrey entered 1988 on virtually everyone’s short list of Heisman Trophy candidates. Those hopes were quickly derailed when Humphrey broke a foot in the season’s second game, against Vanderbilt. He missed the remainder of the year and became eligible for the 1989 NFL Supplemental Draft. Humphrey was drafted in the first round by the Denver Broncos. His impact on the professional ranks was immediate. Humphrey rushed for more than 1,000 yards in his rookie season and led Denver to the Super Bowl. The Broncos were defeated by the San Francisco 49ers in the big game, but Humphrey was named the American Football Conference’s Rookie of the Year. Humphrey credited the tough competition he faced in college for much of his success as a rookie. Humphrey followed his rookie season with another strong year in 1990, becoming the first Bronco to ever rush for more than 1,000 yards in consecutive seasons. He earned an invitation to the Pro Bowl. After another season with Denver, Humphrey was traded to the Miami Dolphins. He completed his NFL career with the Buffalo Bills in 1995. After retiring from football, Humphrey worked in sales and started his own construction company. He kept his hands in athletics by accepting the head coaching position for the Birmingham Steeldogs of the AF2, an arena football league. Despite having no previous coaching experience, Humphrey produced a winning record with the Steeldogs. As Humphrey delved more deeply into the business world, he learned that many of the ingredients for success in athletics also applied to his new avocations. Humphrey and his wife, Barbara, have taught those lessons to their five children, including his son Marlon, who starred in the secondary at Alabama before making himself eligible for the 2017 NFL draft. All of the Humphrey children are star athletes. Although Marlon helped Alabama win the national championship in 2015, Bobby Humphrey looks at the excellence of the Crimson Tide program under Coach Nick Saban from a different perspective. Despite a busy life as a bank executive, Humphrey still finds time to pay his community rent. He is a popular speaker, telling his story of success in football and business to churches and civic clubs, and he coaches a track team on the weekends. And for the time being at least, Humphrey is content with his life. The eye-catching spin-moves and long touchdown runs may be in his rearview mirror, but Bobby Humphrey is always looking forward.